My twenty-second stadium of 2014 was on Saturday 1st November at The Camrose in Basingstoke, Hampshire. 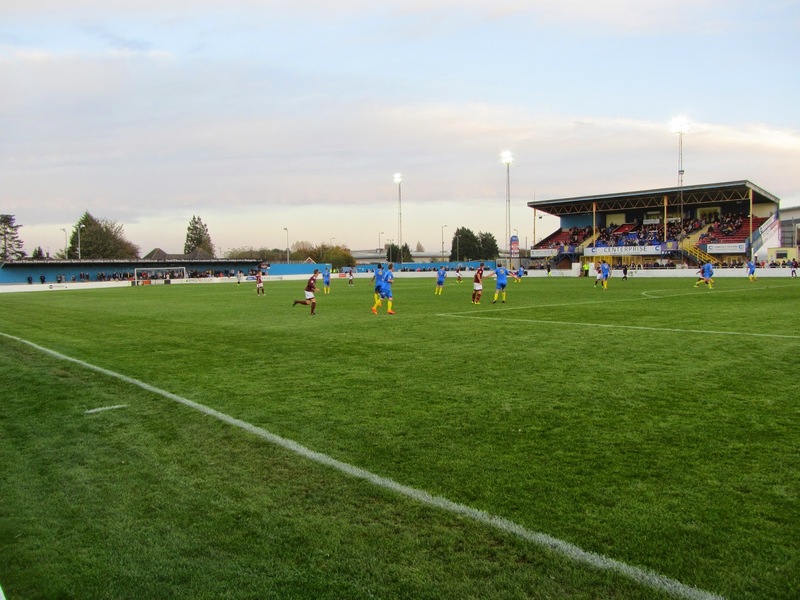 The match was Basingstoke Town vs. Chelmsford City in Conference South. The Camrose is opposite a retail park in the south-west part of the town around 1.5 miles from the railway station. 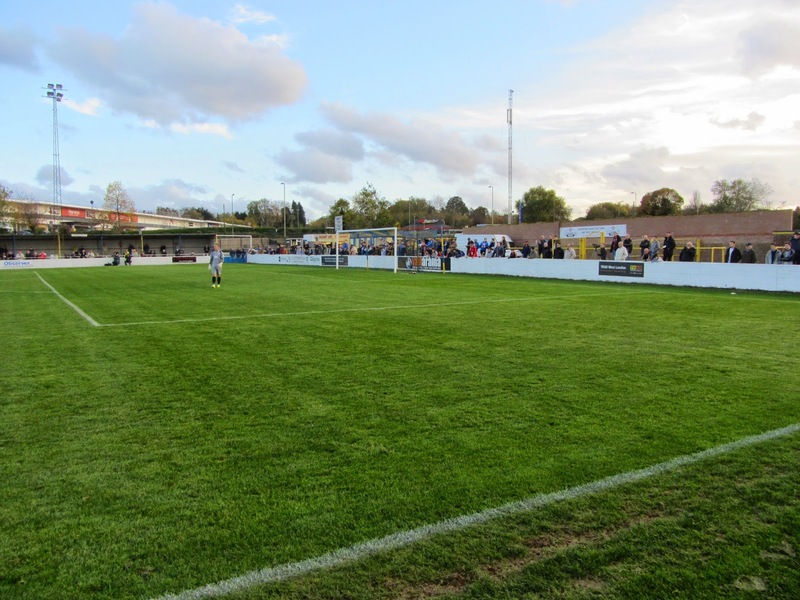 The ground has been home to the club since 1946 though plans have been published to expand the retail park on the current stadium site and move the club to a new venue just south of the town centre. 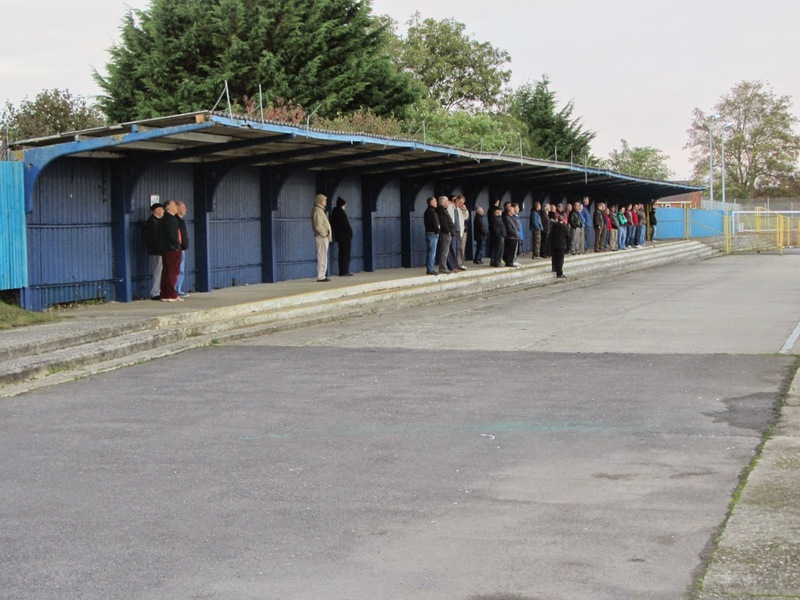 There is a 650 seater stand on the south-east part of the ground in line with the half way line. This consists of a lower section containing dressing rooms and dugouts an upper section for the spectator areas. There are a few supporting columns for the roof and one of the floodlights sits between this stand and the pitch. On the rest of this side of the venue is uncovered standing except for a small covered section to the left of the main stand. There is a large amount of space on the opposite side of the pitch with a covered concrete terrace set quite a way back from the pitch. In front of this is a wide area for uncovered standing. Behind the goal at the north-east end of The Camrose there is another covered concrete terrace while at the other end of the pitch there is more concrete terracing, this time uncovered. Just out from the entrance in the south-east corner of the ground there is a clubhouse located in the car park. Chelmsford looked dangerous from the outset and went close on 4 minutes when Joe Ward's 25 yard effort fizzed just over the crossbar. In the 15th minute they did get their noses in front when Leon Redwood crossed into the box to an unmarked Jason Williams who headed into the corner of the net. A few minutes later the hosts got back on level terms when a defender failed to cut out a through ball allowing to Lloyd Macklin to muscle his way through and slot the ball into the bottom corner. The visitors started the second half strongly and though they had a goal disallowed were able to regain the lead from the penalty spot in the 53rd minute. Jamie Brown needlessly tripped Michael Cheek as he was heading out of the area and Lee Sawyer who stroked the ball home to put Chelmsford 2-1 up. In the closing stages the visitors had to withstand a spell of pressure but were able to hold on to pick up a deserved three points.